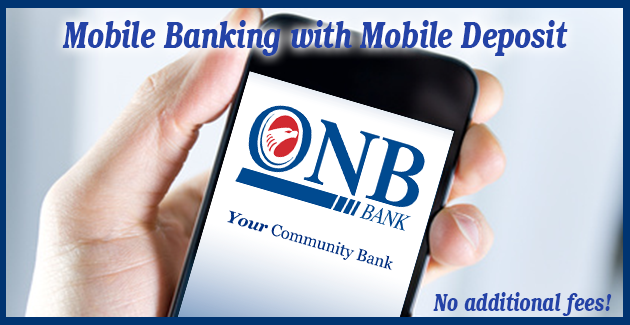 Download the ONB Mobile Banking App directly to your smartphone1. Deposit your check to your ONB Bank checking account from anywhere on your smart phone using ONB Mobile Deposit2, when it’s convenient for you. The ONB Mobile Banking App combines the benefits Internet banking with the power of AndroidTM phones (5.0 or later) as well as the iPhone® (iOS 8.0 or later) , providing quick access to account information. Select your online checking account for deposit and enter the amount of the check. Endorse the check and use your smartphone camera to take a photo of the front and back of the check. Confirm the information on the verification screen and click “submit”. Maintain deposited checks for your records for 90 days. The ONB Mobile Banking App is a free download. Download the ONB Mobile Banking App from the iTunes or AndroidTM app stores. Other fees may apply. Check with your mobile service provider for details on their data access fees or data charges. To learn more, check out these FAQs on ONB Mobile Deposit! 1 ONB Mobile app is available for AndroidTM phones and iPhone®. Your mobile carrier may charge access fees depending upon your individual plan. Web access is needed to use Mobile App. Check with your carrier for specific fees and charges. Some mobile features may require additional online setup. Any fees for optional transactions will be identified during registration for these services and during their use. To be eligible for ONB Mobile Deposit, you must be an ONB Bank Internet Banking customer with direct ownership in an ONB Bank Checking account, accept the ONB Mobile Deposit Services Disclosure and Agreement, and have no more than two returned deposited items in the past three months. 2 ONB Mobile Deposit is available for checks of $2,000 or less. Deposits are subject to verification and are not available for immediate withdrawal.